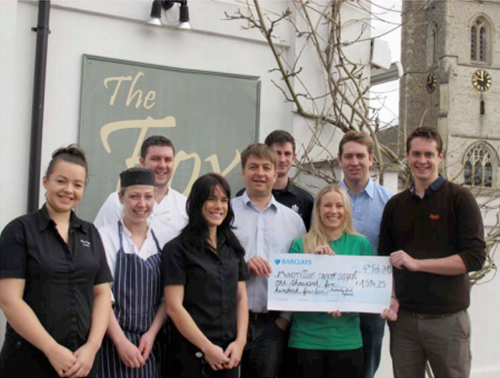 Staff at The Fox, Willian and Hermitage Rd, Hitchin (sister establishments) with the help of their customers and suppliers have raised an amazing amount of £1,514.25 for their chosen charity Macmillan Cancer Support. The funds were raised from various events held recently at both venues. A cheque was handed over to Kerry Briars, Hertfordshire Fundraising Manager for Macmillan Cancer Support, on Monday 4th February. Said Kerry ‘this is an amazing amount to have raised and with 822 people being diagnosed with cancer every day, this sort of donation really will make a difference to the lives of the people affected by cancer. The Fox have been fundraising for Macmillan for several years now and we are really pleased to have Hermitage Rd. fundraising for us too. Macmillan Cancer Support really does appreciate local support, thank you to everyone that helped both establishments raise this huge amount.